Recounting controversial First Amendment cases from the Red Scare era to Citizens United, William Bennett Turner—a Berkeley law professor who has argued three cases before the Supreme Court—shows how we’ve arrived at our contemporary understanding of free speech. 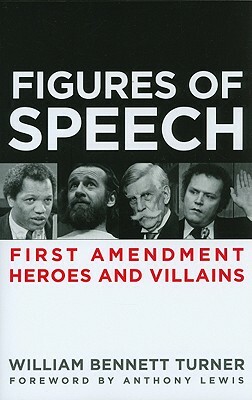 His strange cast of heroes and villains, some drawn from cases he has litigated, includes Communists, Jehovah’s Witnesses, Ku Klux Klansmen, the world’s leading pornographer, prison wardens, dogged reporters, federal judges, a computer whiz, and a countercultural comedian. This is a fascinating look at how the scope of our First Amendment freedoms has evolved and the colorful characters behind some of the most important legal decisions of modern times. For the past 29 years, William Bennett Turner has taught course on freedom of speech and the press at the University of California at Berkeley. He has also taught First Amendment courses at OLLI@Berkeley and at the Fromm Institute at the University of San Francisco. He graduated from the Harvard Law School in 1963 and, after a Fulbright fellowship in comparative law, he spent three years with a New York law firm. This was followed by nearly ten years with the NAACP Legal Defense Fund doing civil rights law. He returned to teach at Harvard in 1977. He founded his own law firm in San Francisco in 1978 and served as its senior partner until 1992. He was of counsel to the firm of Rogers Joseph O&apos;Donnell from 1992 to 2008.